It seems nothing gets people chattering these days like Cadillac, a brand in transition. So when reporter Richard Truett took to autonews.com last week with an "open letter" to Cadillac boss Johan de Nysschen, reactions poured in. Here is Truett's column and excerpts from three emails that arrived in his inbox. Fixing Cadillac will be the biggest challenge of your career, a far larger task, even, than breathing new life into Audi. My brother is a perfect example why. He's 42 and a current -- and very satisfied -- owner of a General Motors product. He's a voracious reader of automotive publications. He can easily afford an ATS, CTS, SRX, etc. He readily admits that technically, Cadillac's cars are interesting, maybe even appealing, at least from a performance aspect. But he's never test driven a Cadillac, and he likely isn't going to. Several of his car-savvy friends feel the same way, I learned during a recent Facebook chat. To them, Cadillac's brand image does not convey the kinds of things they want a car to say about their lifestyles. "I realize Cadillac makes a sound product. But if I told any of my friends that I bought one, they'd ask if it came with a free AARP membership," my brother, a banking executive in Orlando, told me the other day. Johan, this is perhaps Cadillac's biggest problem: The reality of what Cadillac is today is not aligned with target buyers' lingering brand image. To people my brother's age, Cadillac's image is still the floaty, boaty, vinyl-roofed land yachts of years ago. How are you going to fix this, Johan? Your first moves as head of the brand -- moving some marketing functions to New York, and the confusing and soulless letter/number model designations -- have been bankrupt of original thinking. And don't expect the "Dare Greatly" advertising campaign to do much to change Cadillac's image, either. It might be a slick piece of work, but wistful, poetic flourishes of wisdom from a dead president are not going to motivate people like my brother and his friends to visit a Cadillac dealership for a test drive. I doubt they will pay much attention to it. It's troubling that GM CEO Mary Barra signed off on this stuff when she should have said: "Is that all you've got?" and challenged you to come up with a fresh, original plan to go to market and win. I asked GM's product development chief, Mark Reuss, about Cadillac's marketing ineptitude recently and got this terse reply: "When did Cadillac ever have good marketing?" Clearly, marketing is a sore point at GM. That Cadillac's sales are sinking at a time when demand for luxury vehicles is growing (luxury-brand volume has risen every year since 2009, and luxury sales rose 6 percent last year) and the brand has its strongest lineup in history underscores that GM's old way of doing business no longer works -- no matter how good the products are. See, I know something about the new Cadillacs that my brother and his friends don't. I have driven them. I know they are shockingly good, well-made, fast and fun and exciting cars to drive. I know most new Cadillacs are worthy of being considered on equal terms as BMWs and Audis. GM has spent the money and endowed Cadillac with world-class technology -- safety, chassis, brakes and powertrains. And Bob Boniface and his design team have done the heavy lifting and made Cadillacs look great again. But Cadillac's product revival has been underway for years now. And still the most coveted minds -- and wallets -- that Cadillac needs to grow remain stubbornly closed. One way to open them, I think, is to get butts in the seats. Hands-on experience -- especially with Cadillacs being so good -- could be more effective in the long run than throwing tens of millions of dollars at the TV for advertising campaigns in which the target audience is not only shrinking by the day but really isn't receptive to your messages. Couldn't that money be better used to empower dealers to market directly to customers? Take a look at how Ford markets the F-150. Before the redesigned aluminum 2015 model went on sale late last year, Ford rolled out a nationwide program that saw more than 20,000 potential customers take a drive. Cadillac has done similar events on a smaller scale. So, why not create a sustained, nationwide, market-by-market plan to introduce potential customers to the new Cadillac lineup, a plan that supports and empowers dealers to go after competitors locally and directly? Americans love a bargain, Johan. Give 'em one. Part of the DNA of the American consumer is we love to feel like we got a hell of a deal. Word to de Nysschen: "Build the Elmiraj." Cadillac's pricing is out of line with the brand's image (example: ELR, CTS, ATS) and what consumers are willing to pay. Residual-destroying incentives to prop up sales only perpetuate the problem. Price Cadillacs so anyone in the market for a luxury car would be foolish not to consider the brand. You're in a war, Mr. de Nysschen. And you're losing ground against very tough competitors. GM's old-fashioned way won't work in this new era of hypercompetition. You have said you view Cadillac's turnaround as a 10-year project. GM, which has already invested billions in Cadillac and has pledged billions more, is not known for that kind of patience. You are very likely not going to get a decade to fix Cadillac. 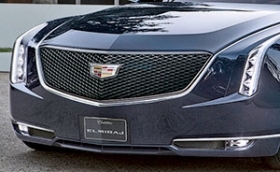 And one more thing: If you want my brother and his pals to start adjusting their perception of Cadillac, build the Elmiraj -- and keep that name.